Mana Island Resort & Spa a hidden paradise nestled in the heart of the Mamanuca group, only 32km West of Nadi and is situated on a 300 Acre lush tropical paradise, amongst white sandy beaches and crystal clear waters. The resort offers an extensive range of accommodation from honeymoon bures to luxury suites rooms or the Modern yet traditional Fijian Bures with each category having their own ambience and features to suit different needs from Honeymooners / Couples or families, and we also cater for small to larger groups. Mana boasts a high quality Spa and Fiji’s first Ocean Front Wedding Chapel, Sea view Events Hall, 2 fresh water pools, 2 restaurants, 4 bars, Padi 5 star dive centre and extensive water and land activities, the Resort also promotes Environmental projects. Our ever friendly staff is one of the reasons why they have a high rate of returnee guests. This hidden haven within the Mamanuca group of islands has truly a blend of both modernized and traditional feel creating that ultimate getaway that you have always dreamed of. Mana offers a range of accommodation to suit different needs and budget. Imagine six distinct room categories, each with their own atmosphere and ambience, you begin to get an idea of the Scope of Mana Island Resort and Spa. 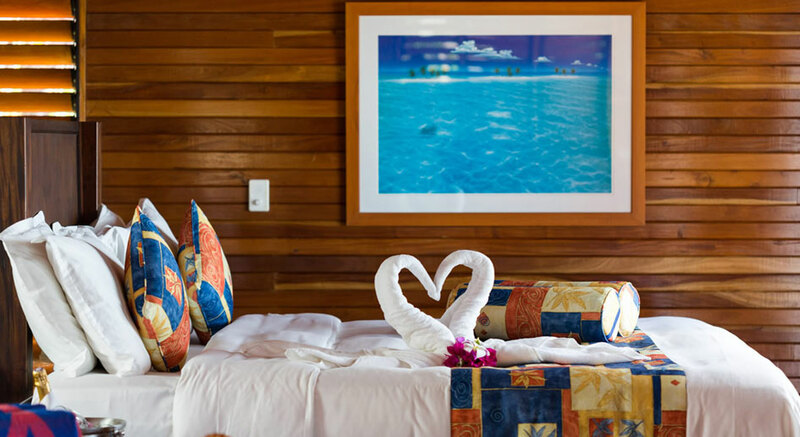 The resort offers an extensive range of accommodation from Honeymoon bures, luxury suites and morden Fijian Bures with each category having their own feature to suite their needs, from honeymooners, couples, families and groups. Mana’s wide range of land and water activities ensure there is fun for everyone. Whether you are searching for an enthralling encounter with sharks, an unforgettable experience of Fijian culture, or a tranquil place to meditate, there are always activities to satisfy you. Mana serves exciting daily activities beginning with cultural shows all the way to fun nighttime entertainment. The activities change daily which means that even if you’re with them for the week, there’s always something new to try each day. Blessed with pristine waters, Mana is the ideal setting for aquatic activities like snorkeling, kayaking, windsurfing, diving and swimming to name but a few. The Mana Spa is nestled against the greener slopes of the island with the soothing breeze of the Palm trees around giving you a calm and peaceful effect. At The Mana Spa they are experts in relaxation. Our Spa Rituals are distinctive in offering an entirely unique approach. Guests and critics are full of praise, we believe you will be too. Featuring 4 luxurious private spa Bures complete with an outdoor Jacuzzi for a Jacuzzi bath in coconut milk for those couple who would love to indulge together. The Mana Spa gives you the luxury of personal space and timelessness to indulge your senses, soothe your body and revitalize your spirit. Surrender to The Mana Spa signature treatments, the intuitive touch of our therapists and the restorative powers of our Pure Fiji & Pevonia fragrant oils. Allow your kids to make new friends and to learn about the Fijian culture while participating in a wide range of fun activities under the caring supervision of our friendly staff. Mana’s‘Tu Vonu’ Kids Club is a great club to leave the little ones. Open for 3 different sessions during the day, the children get to experience the Fijian culture, nature walks and traditional games. The club is centrally located and has a play ground for the little ones. Pay aprox. F$25 per child per Stay for registration and they go back with great souvenir gifts that will remind them of their holiday spent in Mana. Once a month the little ones also get to join in the ‘Environment Day’ whereby they would learn more about the natural surroundings and they get to participate in either planting trees or planting coral as part of our Coral regeneration program. Club Opening time; 10:00am – 12 noon, 2pm – 4pm and 7pm – 9pm. Ages: 3 – 12 years.